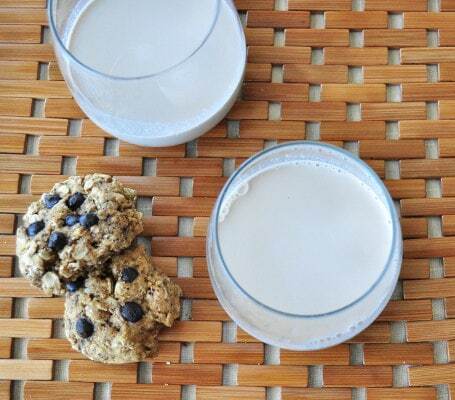 Making your own milk is easier than you think. I already have recipes for Homemade Almond Milk and Homemade Hemp Milk. Now I can add hazelnut to the list. This, by far, is my favorite. Now if only hazelnuts weren’t so darned expensive! Making hazelnut milk is very similar to almond. You will need to have some items on hand. First, you need to get a good extra fine cheesecloth. I made the mistake of buying the wrong one the first time around. I got this one off Amazon and it works great. Next, you will need an extra fine strainer and a large bowl. Lastly, it helps to have a funnel when pouring the finished milk into a jar. I store mine in a large mason jar. Put the rinsed hazelnuts, water and vanilla into a blender and blend for about 2 minutes. Cover the fine mesh strainer with the cheesecloth and pour the blended mixture slowly into the strainer. I only do a small amount each time. Grab the cheesecloth and “milk” the nuts until it seems like you can’t get any more. Empty the leftover “meal” onto a lined baking sheet. Repeat these steps until the whole mixture is strained. Using a funnel, carefully pour the milk into a container and store in the fridge. It should keep for at least a week. Keep in mind that it will separate in the fridge so you will have to give it a good shake before using it. You can dry out the leftover meal in the oven. Bake it on about 200 for a few hours until it feels dry. It think you can do it in the dehydrator as well. I have plans for the meal as well so make sure you save it. I'm excited to try this recipe--thank you! One question: do I use the soaking water as the water you combine with the nuts in the blender, or is it fresh water? Thanks again! You rinse the soaking water and then add new water to mix with the nuts. I hope you enjoy the recipe! Have you come up with anything to use the Hazelnut meal with? I luckily have 2 massive hazel trees in my garden so the cost is rather non-existent for me, and thus i appreciate the recipe as shop bought hazelnut milk is expensive and i am lactose intolerant. I did wonder though whether you have tried making the milk with 'fresh' hazelnuts that are still slightly green? The nuts themselves are juicier and have a fresher taste than fully matured hazelnuts that normally you find at christmas time in brown shells. I shall certainly give your recipe a try with both types of nut as i have a massive bowl of last years' crop still to get through. I am just hoping that it is possible to freezer some of the milk for later in the year too and already thought of turning the pulp into flour as i can use it to make mince pie pastry with this christmas as i have a damson plum and hazelnut mincemeat recipe to try out. Thank you.